Butterflies of Iguazu Falls | Where to next? I was completely astounded by the incredible number and variety of butterflies fluttering around Iguazu Falls. We first saw them on the Argentine side of the falls. We arrived early in the day when the butterflies are resting on plants and railings of the walkways that lead to the falls. As the sun dries their wings, they start to fly about. Sometimes many types come together in what are called assemblies, with literally hundreds of individuals in close proximity. Most of these photos were taken on the Argentine side. The railings in the background are mostly from the Paseo Garganta del Diablo, a 1-kilometre-long trail that takes visitors directly over the falls of the Devil’s Throat, the highest and deepest of the falls. 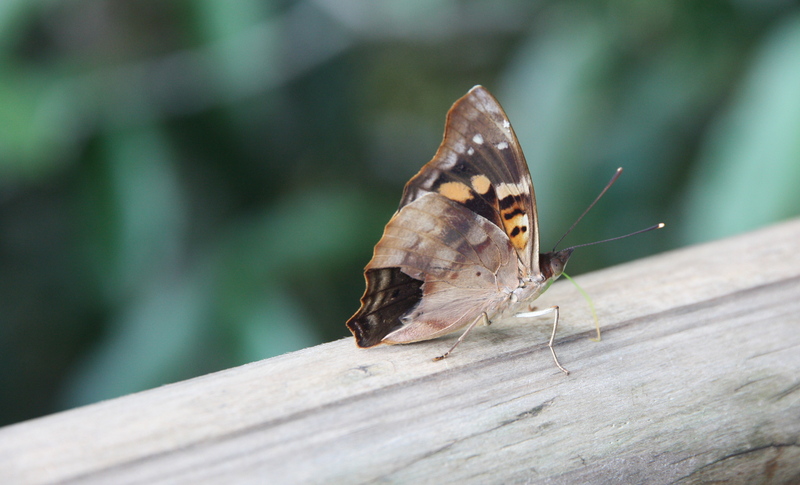 We saw a lot of other wildlife on our walks through the falls, but I wanted to devote this post to butterflies only. If you ever get to Iguazu, go in the morning, take your time and watch where you step. P.S. I’ve been able to identify only a few of these magnificent butterflies (and probably a moth or two). I found a website that shows there are almost 800 different types of butterfly at Iguazu Falls, but there were pictures of only about 30. Let me know if you can ID any of them. P.P.S. A big thank you to Roberto R. Greve, a butterfly researcher, who has kindly identified many of these. Most appreciated. Click on or roll over a pic to see added info. G’day Absolutely gorgeous Peggy! Love butterflies too! There must be a reason they are attracted to Iguazu Falls! 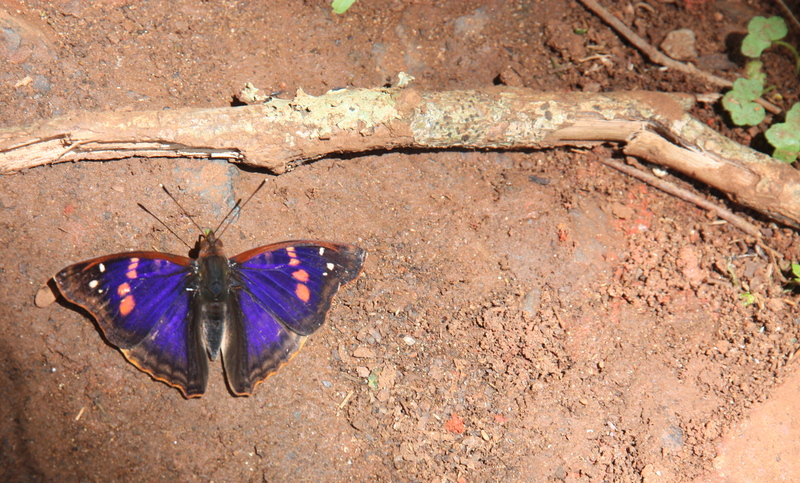 I’ve read that Iguazu is one of the best places in the world to view lots of butterflies. I feel so blessed to have seen so many. Those were fantastic! What an experience! It really was incredible. I wish I knew the names of more of the butterflies. Once, while walking across an endless paved parking lot on a very hot day, a tiger swallowtail butterfly landed on the corner of the frames of my glasses. I stopped, a bit amazed at my little hitchhiker’s boldness. It sipped on a bead of sweat near my eye, then flew off. It was a very spiritual and uplifting moment! It would have been an amazing experience. I find it uplifting when they just land on my arm. Amazing Peggy, almost unbelievable! What beauties and what nice photos! Thanks so much. I felt so privileged to see so many butterflies when we were there. Wow! So fascinating and gorgeous. Thank you for the beauty. You are most welcome. So glad I was able to share. I love butterflies, and always try to capture them… but when I get close they fly away! Great shots. Thanks Lily La. It was so amazing at Iguazu. The butterflies landed on our clothes as well as on our arms and legs. How can you reached about using one of your photographs? Which photograph do you want to use and where? It is the red butterfly with the black edges on the concrete. It would be for a philosophy book cover. It’s a wonderful shot that would fit the cover perfectly. Time is of the essence as we are going to press, if you could let us know soon it would be appreciated. Thanks! I’m sending an email tonight. I’m travelling in remote India so have not had an internet connection. The butterfles in Iguazu were so amazing and they hitched rides on us for hours. Love these photos and all your Brazil captures. We have such amazing memories of The Amazon and Brazil. So do we. Such special places. Wow, so many varieties and so beautiful! The butterflies at Iguazu were absolutely amazing. Nature’s beauty at its best! 🙂 happy to stumble upon your blog! Would love to read about the other side of the globe! :)greetings from India! Greetings back to you. We will be in India for October and November. That’s lovely! Where in India? Will be happy to help for any info! Thanks for your offer. This trip we will be in the south. Iguazu Falls from the Argentine side | Where to next? My butterflies hit the big time | Where to next?